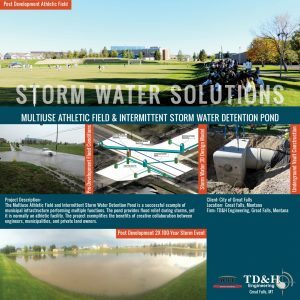 TD&H Engineering is excited to announce that the Great Falls office has been awarded top honors from ACEC-Montana for their work on the City of Great Falls’ Multiuse Athletic Field & Intermittent Storm Water Detention Pond. This project received the ACEC-Montana’s Grand Project Award in the 2017 Engineering Excellence Awards Competition. We would like to extend a great thanks to the City of Great Falls for giving our firm the opportunity to work on the project. Jim Rearden (Public Works Director), Dave Dobbs (City Engineer) and Courtney Lyerly (Civil Engineer) were instrumental in the success of this project.